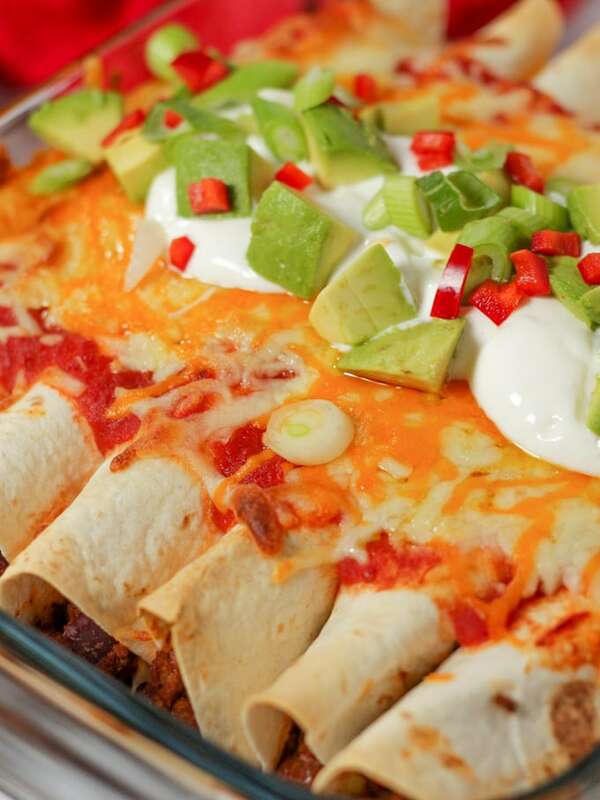 This easy Beef Enchiladas recipe is a delicious and tasty midweek dinner. 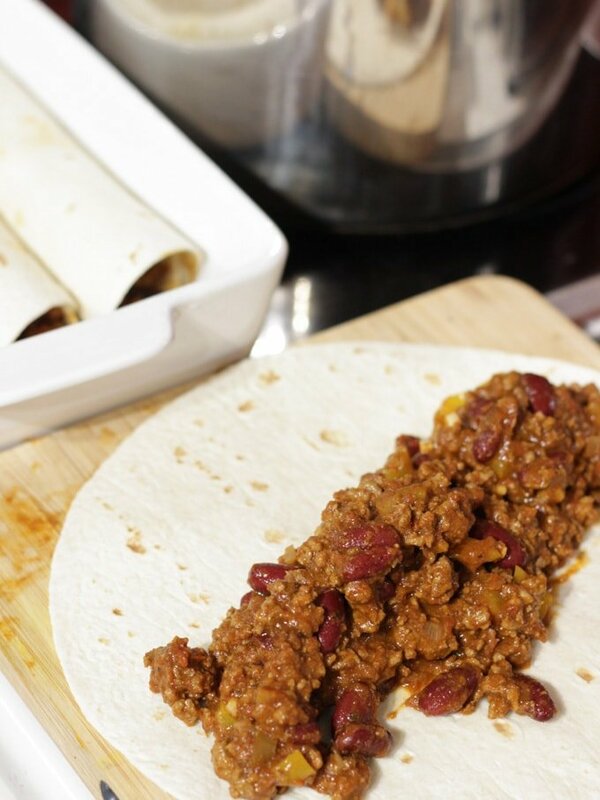 Using minced beef and a healthy tomato based red sauce, all rolled in your favourite wraps and topped with cheese. It can be made ahead and frozen and can easily be made Slimming World friendly. Important news flash, my children said this was the BEST DINNER EVER. High praise indeed, when faced with fish fingers and pizza options too, right?! I have to be honest, I’m never a big fan or tortillas, or wraps. I tend to find them a big doughy, but in enchiladas, where they are stuffed with meaty deliciousness and topped with ALL THE cheeeeeeeese, they kind of morph into something even I love. Add to this the fact that you can make two dinners at a time, cook once, eat twice and I am ALL OVER THESE. Packed with secret hidden veggies, it really can be a one pan meal. You can make two at a time and whip dinner ready made out of the freezer another night. YES. 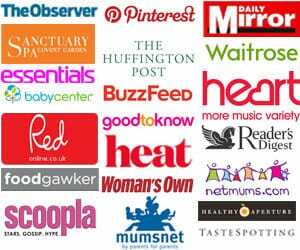 This are just warming in their spicy taste, a good way to introduce kids to new flavours and taste without being overpowering. Hope they make their way on to your weekly meal plan and you like them as much as we do. 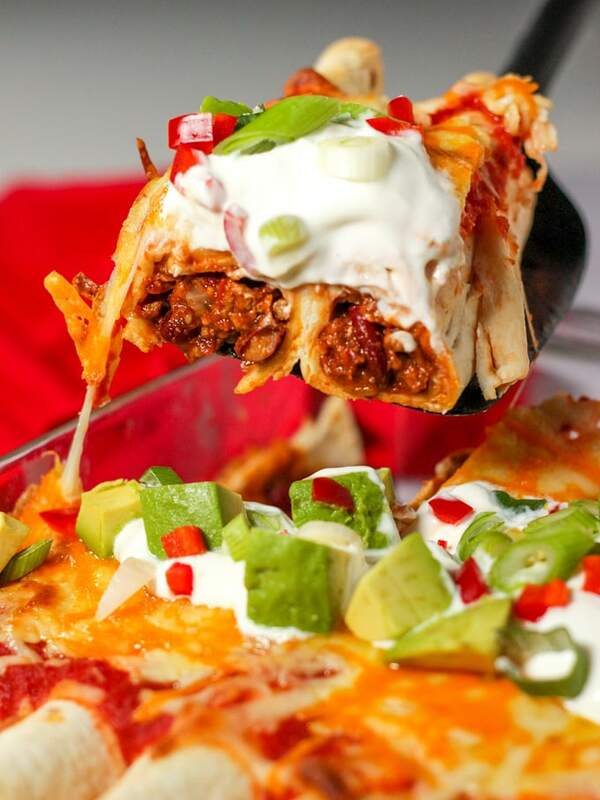 I have to tell you, these beef enchiladas, are in no way authentic Mexican food. 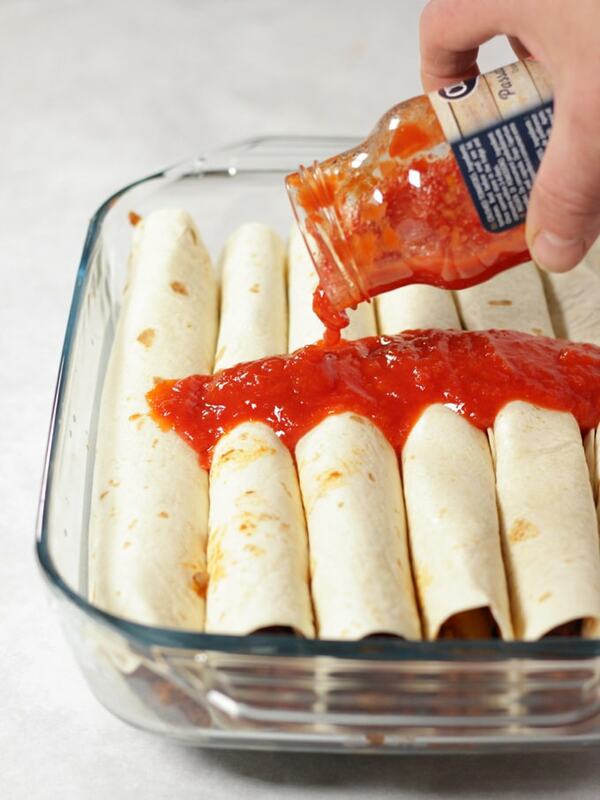 An enchilada red sauce is usually made with a roux (flour and stock or fats) plus spices. In this version, I use a tomato base because it’s so much easier for a midweek dinner, PLUS it adds in extra vegetables and nutrients. Win win. 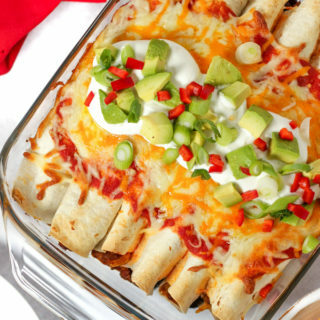 These beef enchiladas are surprisingly easy to make. 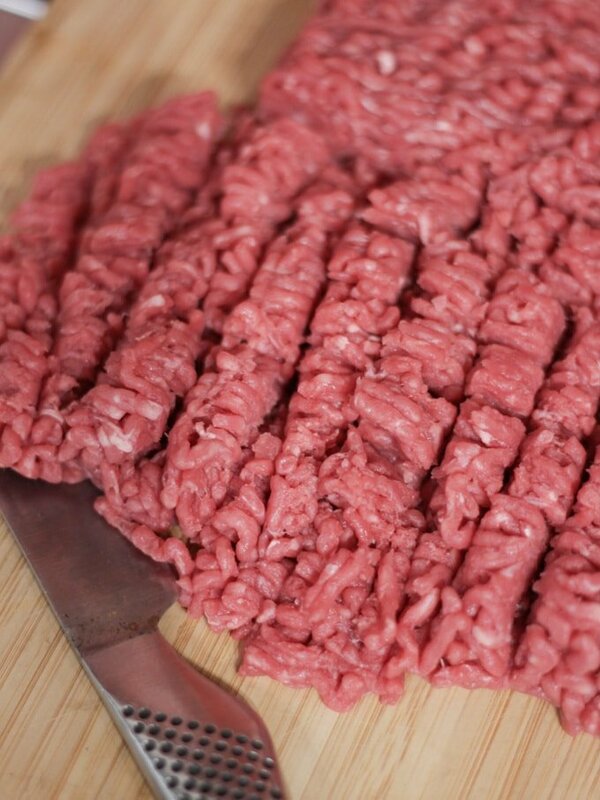 My first top tip is to chop your mince beef up before cooking it. Next heat the olive oil in a large saucepan and brown the minced beef for about 5 minutes. 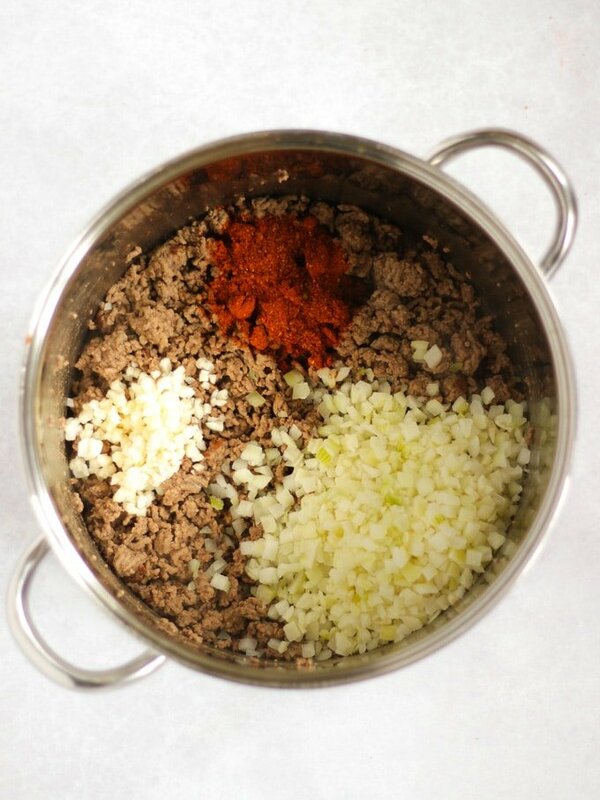 You want the beef mince to start to get crispy bits around the edges so don’t shuffle it about too much. Next add onions, garlic, cumin, oregano and chilli. Cook for about 5 minutes on a low heat until the onions are almost cooked through, coloured and fragrant. 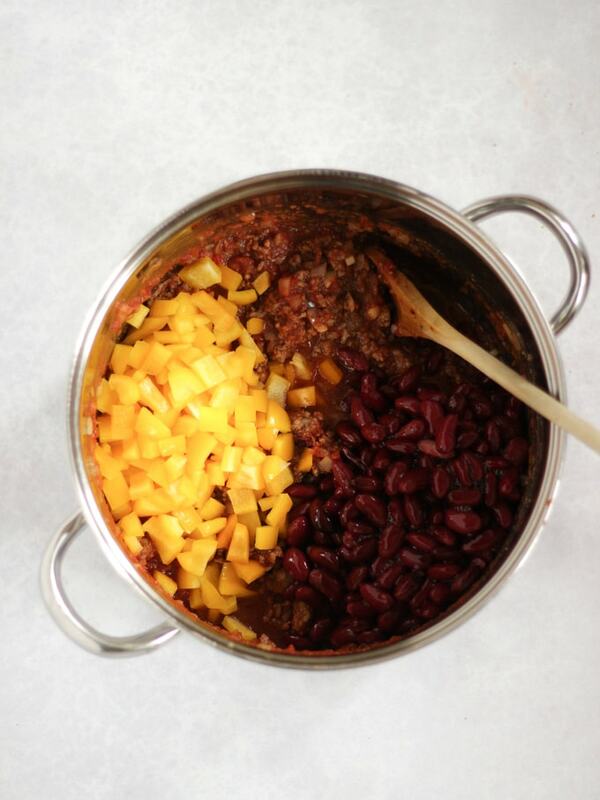 Now add, around 800g of passata (reserving the rest until later in the recipe), kidney beans and chopped peppers. Cook for a further 15 minutes on a medium heat, stirring occasionally. Add plenty of salt and pepper. Lay the tortillas out and share the mixture evenly between them. Roll each tortilla up and place on top of the thin layer of sauce, being sure that the open end is at the bottom, so the weight of the tortilla keeps them shut. Spoon the remaining sauce over the top and sprinkle on the cheese. 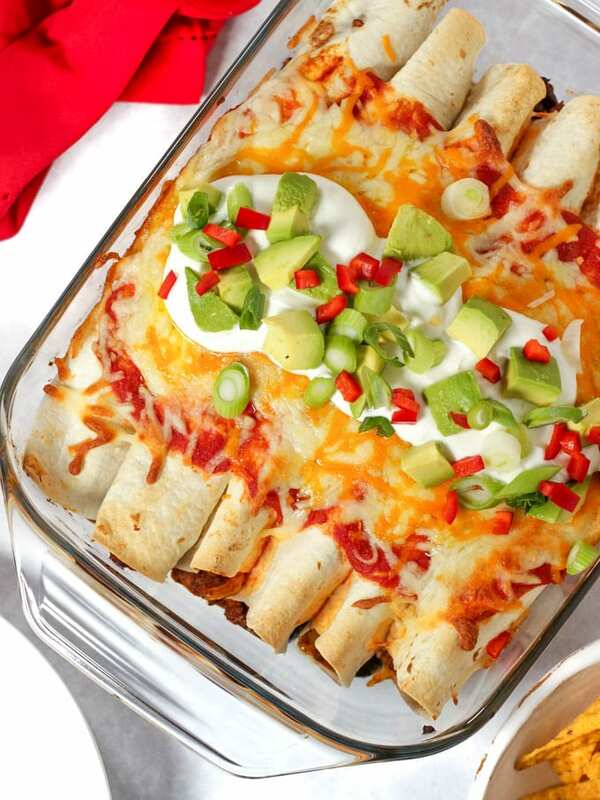 Bake for about 15 – 20 minutes until the inside of the enchiladas is hot and the cheese has melted. 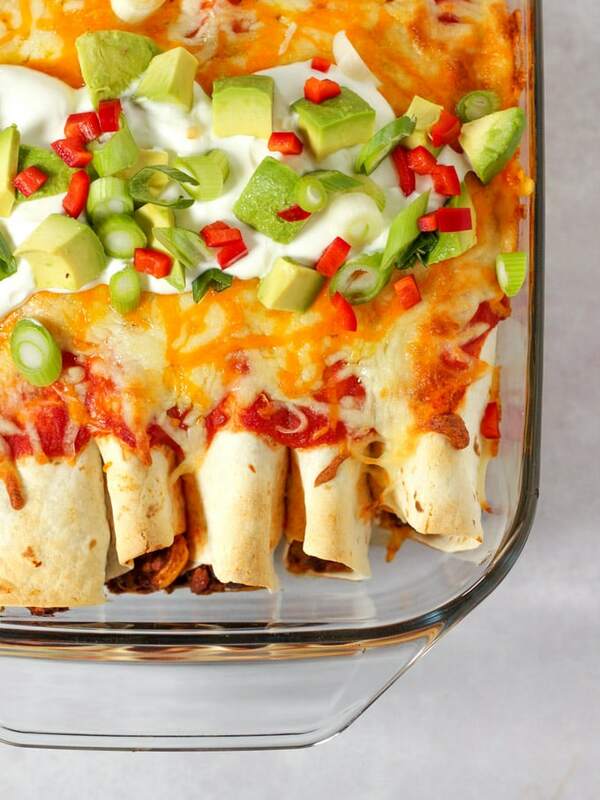 This recipe makes TWO whole meals of these beef enchiladas. I LOVE cooking like this because I cook once, and we eat twice. You can see in the photo below, I’ve just covered one of the casserole dishes, unbaked, ready to freeze. You do end up losing one casserole dish to the freezer for a couple of weeks, until you use it, but I feel like it’s a small price to pay. OR you can use takeaway style foil trays to freezer your extra, unbaked portion. Use whichever wraps you like, but if you can find CORN TORTILLAS they are a little more authentic (I think!) I really like the texture of them, although George and Harriet prefer the regular ones. A fairly deep, but sturdy rectangular dish works well for this recipe. I like this one, which is also a total bargain price: Oven Safe Serving Dish on Amazon. My most favourite knife in the whole world to make light work of chopping the meat and peppers. 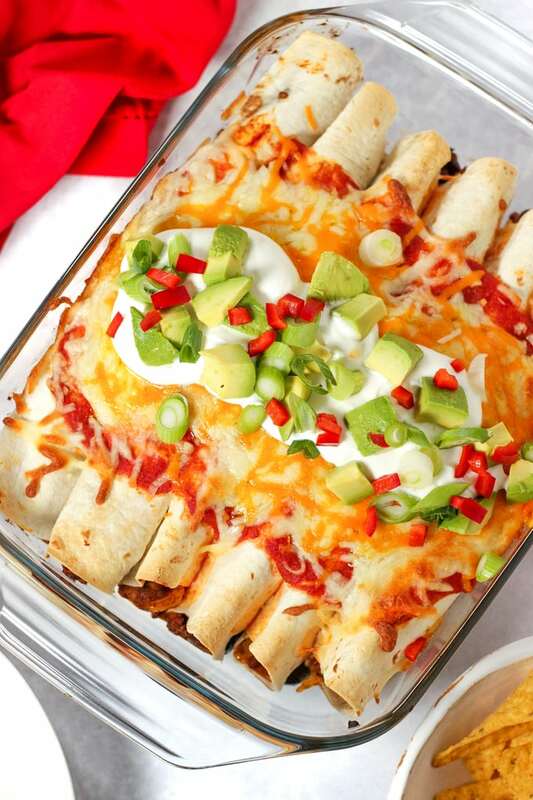 WHAT TO SERVE WITH BEEF ENCHILADAS? A green salad, with chopped cucumber, peppers, tomatoes and carrots for the children. I’ve used a mixture of Mozzarella and Red Leicester cheeses, which gives that lovely stringy cheeeeeeeseyness (def a word right?) and also a lovely golden colour. You can use whichever grated cheeses you prefer. You can also use the Beef Enchilada filling with rice or as a pasta sauce, or inside pitta breads or lettuce leaves when low carbing instead of in the tortilla wraps. To make spicy beef enchiladas add one or two (depending on taste) deseeded and chopped red chillies when frying you onion and garlic. Fancy some more Mid Week Meals? How about..
Hope you enjoy this recipe as much as we do. I’d love to know how you got on and what you thought of it if you make it. Give me feedback by rating the recipe and leave me a comment below if you do. If you enjoyed this recipe, subscribe to my newsletter for weekly meal plans, and follow me on Facebook, Instagram and Pinterest for lots of chat, recipes and life updates! 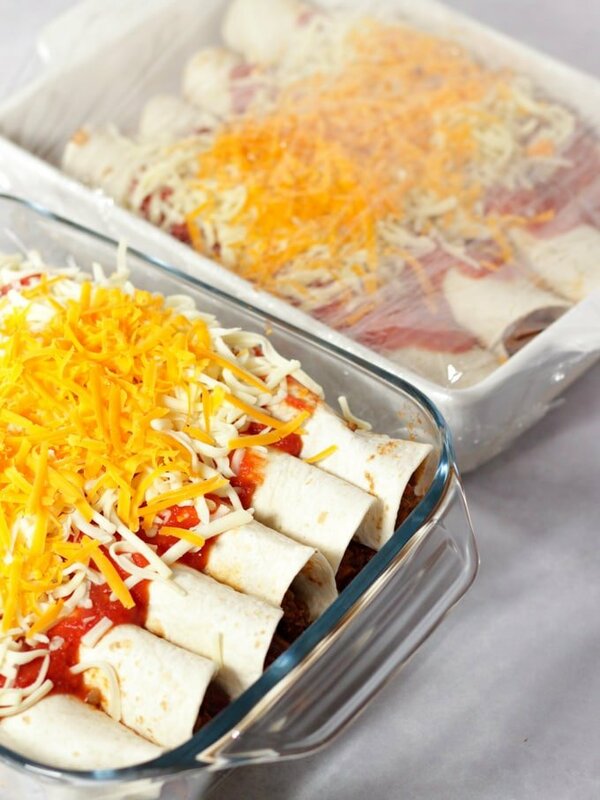 This Easy Beef Enchiladas recipe is a delicious and tasty midweek dinner. This recipe uses minced beef, a healthy tomato based red sauce, all rolled in your favourite wraps and topped with cheese. It can be made ahead and frozen and can easily be made Slimming World friendly. Preheat the oven to 180C fan (200c conventional). 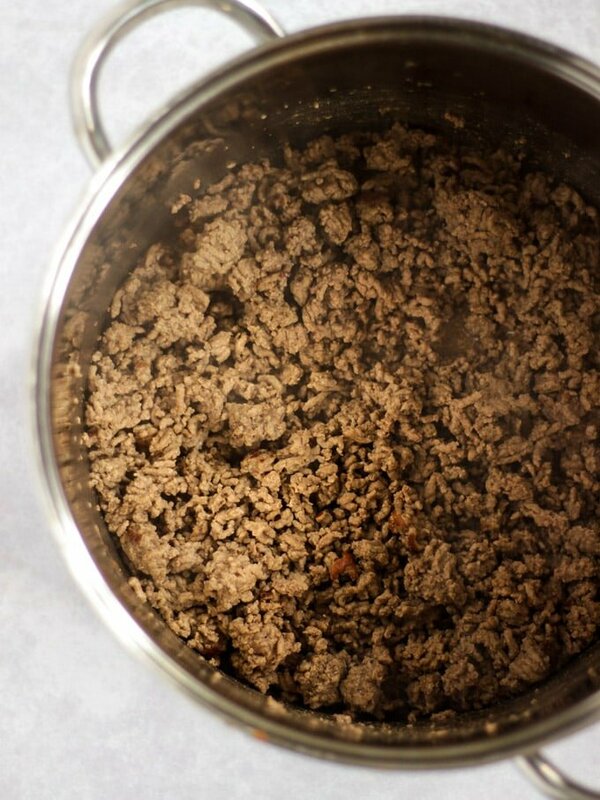 Heat the olive oil in a large saucepan and add the minced beef, cook for around 5 minutes until the beef has browned. Add the onions, garlic, paprika, cumin, oregano and chilli. Cook for about 5 minutes on a low heat until and the onions are almost cooked through, coloured and fragrant. Pour in around 800g of the passata, add the kidney beans and peppers and turn up the heat to medium, put a lid on the pan and cook for a further 15 minutes. Lay the tortillas out and share the mixture evenly between them. Put half of the remaining passata on the base of a baking dish and spread out. Spoon the remaining passata over the top and sprinkle on the cheese. Bake for about 15 - 20 minutes until the inside of the enchiladas is hot and the cheese has melted. This recipe made enough to serve 8 (so I make it as two dinners worth, but you could make 4 dinners if there's only 2 of you!) if you need less you can simply half or quarter the recipe. I find a mixture of Red Leicester and Mozzarella gives the best cheesiness and also looks good. STORAGE: This freezes really well for an even quicker meal on busy evenings. Just cover well and freeze before baking. The tortilla wraps can go a little bit softer, to avoid this just freeze the sauce/filling and then assemble the defrosted filling with fresh wraps on the day you want to serve them.